Today was our first real day of climbing. As our galley crew was on supper duty we wanted to get away early. Shortly after 7:00 we were on our way. I rode with fellow crew mates Elaine and Michel. There wasn’t a cloud in the sky as we left which made for a great view of the mountains as we put Hope behind us and made our way to the start of the Coquihalla Highway. Initially it was a fairly easy ride before we started the start of what was essentially about a 34 km climb to the summit. 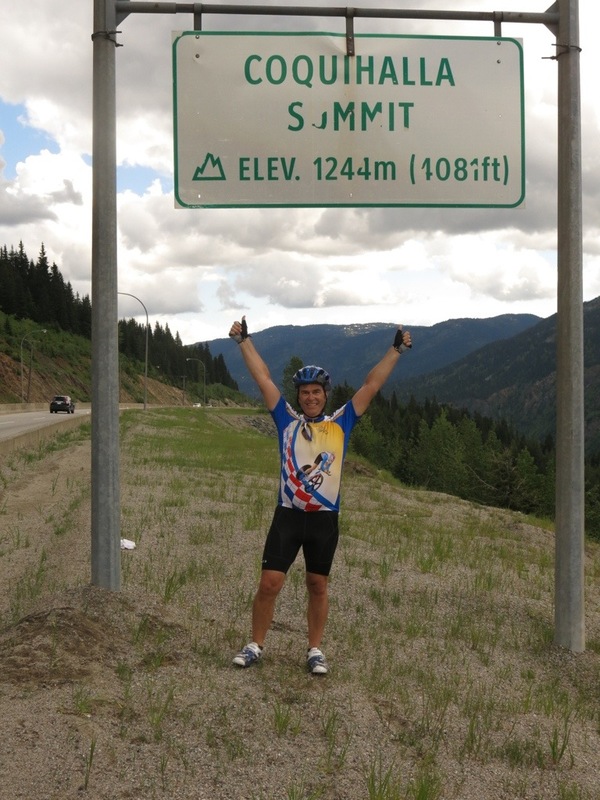 The first 27 km of this climb was between a 4% and 6% grade which made for a long grind. With rest stops every few kilometers we made our way to the snowshed where the real fun began. 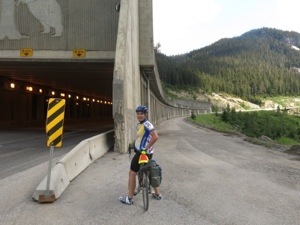 A snowshed is a covered part of the highway designed so any avalanches flow over top instead of blocking the highway. Fortunately this one had a path around the outside so we didn’t have to ride through it. From here the climb turned into an 8% grade pretty much for the last 7 km to the summit. Rest breaks became more frequent as we slowly progressed upwards. Finally we were there! What a great feeling it was to know that we had done it! I celebrated with a PB&J sandwich! About 8 km of mostly downhill past the summit we stopped at the Britton Creek rest stop. There was a concession truck there from which I bought some chocolate milk and water. As I was eating my second PB&J sandwich of the day other riders were rolling in and out. After we had rested for a while we were again on our way. Just as we left it started to rain. Fortunately it only lasted about half an hour before it cleared off and became a nice afternoon. At one point we hit a nice long, steep downhill section where I got up to 70 kmh as we flew down the hill. Towards the bottom we turned off onto a secondary road for the last 30 km or so into Merritt. 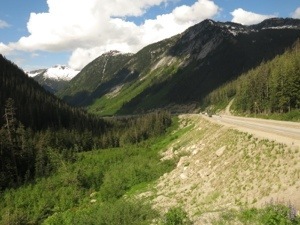 There was very little traffic on this road which made a very nice change after the roar of the Coquihalla. 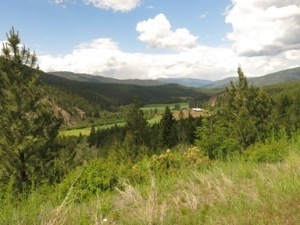 While there were some uphill bits most of the road was downhill as we made our way down into the Nicola Valley and into Merritt. We arrived at our campsite around 2:30 with plenty of time to pitch our tents and have a shower before we had to start preparing supper. Aussie Greg and Yukon Greig (the other two members of our galley crew) were already in camp. Total distance for the day was 111 km. Dinner was refried bean burritos which were quite delicious. One of the great things about this tour is that food is prepared using fresh ingredients. Nobody is going hungry! After dinner we had a group meeting where we formally introduced ourselves although by now pretty well everyone knew everyone else’s name. With the rest of the evening off, and no ride tomorrow, a few of us went to the pub in the Claymore Hotel. It was a great way to finish off the day.